Who Does Better for the Economy? Coming from Brad DeLong’s Website – this chart really puts things in perspective. GDP = Gross Domestic Product and, for those who need a definition, is defined as: as the total market value of all final goods and services produced within the country in a given period of time (usually a calendar year). In other words, comparing year over year will show the growth of the economy. Gee, Roosevelt III, Truman, Kennedy-Johnson, Johnson, Clinton are all Democrats. Nixon I (a Republican) was benefiting from the end of economic boom under Johnson. Roosevelt-Truman administration was at the end of World War II and dealt with rebuilding after the war. 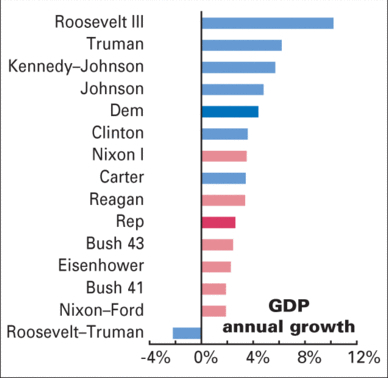 Even the great Ronald Reagan could not match the growth of any Democrat except for Carter. What does that show? That the Democrat’s philosophy (hint hint – including regulation and oversight…and not a totally free market environment) has proven more successful. Additionally, Bush 41, Bush 43, and Reagan prove supply-side (or trickle-down) economics (which means lower taxes to the wealthy) may not be as relevant as reducing the burden on the middle class. Brad’s website has a lot of graphics and all of them demonstrate the positive effects of a Democratic Administration. I will not discount the affect Congress has, after all they are responsible for a major player. Per Wikipedia: Roosevelt, Johnson, Kennedy, Carter had 100% Democratic House and Senate to support their policies. Truman had control of the Senate and House 75% of his term, and Clinton only 25% of the time. Don’t forget, we emerged from the Bush 41 recession under Clinton during the two years the Democrats held both Houses of Congress. What does that prove? That when the Democrats control the House, Senate, and White House they have policies that progress this Country forward economically. The GOP, in some quarters, are advertising that if you think Obama is going to win the White House, you should vote for the Republican Congress to keep him honest. Don’t buy this argument! The facts prove otherwise. 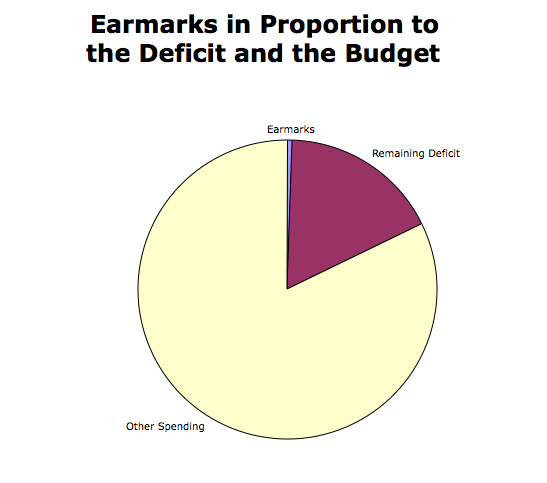 Before we go nuts over ‘earmarks’ – how much of a difference does it really make?